It saves money, gives you a feeling of accomplishment, and allows you to leave out all the harmful ingredients commercial toothpaste is made of. Oh yeah, and it takes less than 5 minutes to prepare. peppermint extract @ 1 oz = $3.00 | 2 tsp is .33 oz which = $1.04 | Better yet, use peppermint essential oil @ 1 oz = $13.00 | 15 drops = $0.28! Note: you can use as much or as little peppermint, or other flavors, as you wish. Add the flavoring little by little until you reach an amount you enjoy. Prior to making our own, we were using Tom’s of Maine Spearmint Gel® costing an average of $5.00 for a 5.2 oz tube. Based on the calculations above the same amount of this homemade toothpaste will cost between $0.63 and $1.39 for 5.33 oz, depending on how much flavoring is used. The cost savings will be between $4.37 – $3.61 per tube! Aside from cost, there are many other benefits of homemade products. By making this toothpaste not only are we cutting costs by upwards of 300%, but we also know the exact ingredients and count time spent as fun, educational, and useful for all involved! Remember, each batch yields the equivalent of one 5.3oz tube of toothpaste which you can store in a small storage container somewhere close to your toothbrush. When you are ready to brush, simply wet your toothbrush, scoop or spread as much paste as you like, and begin brushing. 2. Mix together baking soda, optional salt, and peppermint. Add a little water at a time, stirring after each addition, until paste reaches desired consistency. That’s it! You’re done. Now go get rid of that bad breath! What should we store the paste in? In a container of your choosing close to your toothbrush. We prefer to use essential oils in our toothpaste, which should be stored in glass. We use a small glass jar and store out of heat and light so oils don’t degrade. Should we each have our own container, or can we share with others? If cooties bother you then get your own container, if not then don’t worry about it. My wife and I share one. Simply wet your brush, scoop or spread on some paste, and brush away. At pretty much any store, or you can buy them online through the links above. No. But that is just my opinion since I am not a dentist, but the FDA does regard the ingredients as safe. What about fluoride, don’t we need it? Not in my opinion. The research I have done reveals fluoride as a toxic poison. Dentists typically say it is beneficial when applied to the teeth of children, but I encourage you to do a little research of your own… I’m guessing you’ll come out holding the same opinion as me. 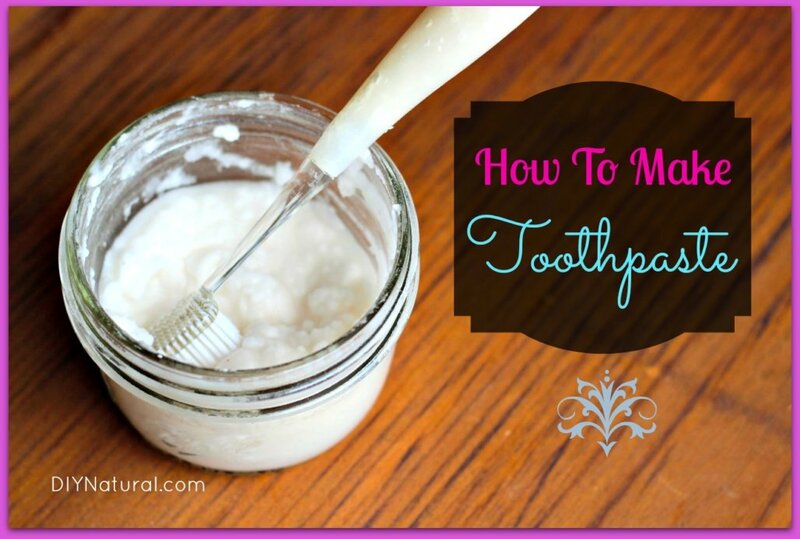 There are so many ways to make homemade toothpaste. We encourage you to find the proportions and ingredients for a toothpaste you’ll love. We even enjoy brushing our teeth with a homemade tooth powder now, that includes special ingredients for extra whitening! You can see the recipe here. Next time you buy a tube of toothpaste, look carefully at the colored stripes found at the bottom, near the crimp. The color of the stripe will tell you just what’s in that toothpaste. Here are the color codes and what they mean. I have recently gotten into DIY projects and one of them I would like to try is the DIY toothpaste. My questions is, how long is the mixture good for? A couple months, until gone, etc.? If you want to learn a bunch about fluoride and oral health, check out this amazing web site. IAOMT stands for “International Academy of Oral Medicine and Toxicology.” They know what is up on so many levels and can get anyone in contact with holistic doctors and dentists who can and will help you to heal yourself… naturally! 1 part sea salt to 6 parts aluminum-free baking soda. So, if you take 6 teaspoons of baking soda, then add 1 teaspoon of sea salt, and put this in a coffee grinder for 30 seconds… which takes away the abrasiveness. The combination of the sea salt and the baking soda kill bacteria by breaking down the cell of the bacteria, and then killing it from within. Also a few drops of essential oils like tea tree oil, clove oil, rosemary, lavender, and others, help to keep the oral cavity clean and healthy. I have not used fluoride toothpaste in over 15 years, and my teeth are healthy now. I spray HP on my toothbrush, and rinse it off, then I use a baby spoon to scoop the tooth powder onto my toothbrush and brush my teeth, the roof of my mouth, the space between my gums and cheeks, and also under my tongue. I also gargle with it, and swish and spit it out. I also use coconut oil to swish and spit out sometimes. I also don’t consume sugar anymore, nor do I drink alcohol, and only eat sprouted grain bread instead of regular bread. I also consume lacto-fermented foods and kombucha for the probiotics as well as the chelating effects of the kombucha, plus I love my leafy greens. I’m still healing from heavy metal toxicity (including fluoride poisoning), it takes time, but I got my life back. I am missing some fillings that fell out, but my oral health is better, and my teeth are healthier and whiter than ever. I also use colloidal silver to kill bacteria in my mouth, and in my body, and on my skin and in my inner ears. Systemic, Hyphal, Fungal Candida live in the inner ear, the skin, the jaw, the digestive tract, and many other places. Its a hard thing to get rid of… but not impossible. Note, you must repopulate yourself with probiotics after using colloidal silver, as it does kill all bacteria, including the good guys. Its hard on candida though! I make my own toothpowder, but I don’t make wet toothpaste. We can get spray bottles of hydrogen peroxide in our local drug stores, so I spray my toothbrush before dipping in my toothpowder. Just a note to share that I’ve been a reader/subscriber for quite a while. Recently I have been paring down my e-mails and subscriptions, so I’m down to around 50 e-mails in my box at all times!!! ~but I kept my subscription to DIY Natural~ 🙂 Thank you for always sharing such great stuff!!!!! At my last dental checkup, I asked my dentist about his thoughts on baking soda & charcoal as toothpaste and on oil pulling. He said he had heard of oil pulling and knew of a few patients that swear by it, but couldn’t say anything about it from personal experience. As for charcoal & baking soda- he said they are great for removing surace stains, but because they are abrasive, they can wear down teeth, so don’t brush too hard. Im actually making a version with coconut oil, but cant get the coconut oil to stop separating from the powder/herb mix (similar to your tooth powder recipe with sage)… suggestions? Try blending it together to emulsify. Yeah, I tried that… it really wont mix, dunno why. It blends for a while then separates. I tried blending it in a ninja blend for a long time, blending and reblending… got nice and smooth, just refused to stay mixed. I have an immersion blender but I dunno if thatll make a difference. Maybe if I whip the coconut oil first? Hmmm. I was using several powders (cinnamon, clove, sage, baking soda, dolomite, xylitol) along with coconut oil and peppermint oil. Anywho… a lot of powders… what happens is the powders separate to some degree, then the oil floats on top… but the powders are still wet and become almost solid. Maybe Im using too much oil? I noticed when I add a lil water, the powder wont turn rock solid and can be shaken up and mixed with the oil again easily, but Id like to get it to a state where it would be a consistent paste and would separate at all. Any other ideas? My kids don’t like the “spicy” sensation of commercial toothpastes. I am looking forward to making this! Should I use peppermint extract or peppermint essential oil for the toothpaste recipe? And if I use essential oil which brand is the best? Peppermint essential oil is best, this is the brand we use and recommend. Hi there, I’ve had some hit and miss successes with homemade tooth powders, but I really like paste consistency. I was wondering if you had any trouble with your paste recipe going bad. I’m always a little wary of adding water to my DIY projects for long term usage since they tend to grow things rather rapidly when I do so. What would you suggest for a 1 and 1/2 year old? Currently using non-fluoridated toothpaste of the toddler variety. And how often would you recommend brushing her teeth? She does drink juices and milk and eats quite a bit of fruit. We have no children so I’m not sure. Can someone in the community weigh in? Thanks everyone for all the information and the comments on this page. Thoroughly useful in the process of unlearning all the bad habits our society has taught us! best wishes to all. Would you really want to use a bleached salt in toothpaste when your trying to get away from chemicals in your toothpaste in the beginning. I would suggest a salt that wasn’t bleached. Also i would suggest a food grade peppermint oil as well. What is the sea salt supposed to do? I just made this using orange essential oil. I have added 40 drops and it still is extremely salty (I didn’t even add the salt!) any suggestions? Also, a good storage container is a honey bear bottle 🙂 I put mine in that and it works really well! That’s the baking soda, it tastes salty, just use less and add more essential oil or possibly some xylitol. Blessings. I want to make my toothpaste flavor orange. I found orange oil used for making candy. Will that work? Sure will Kari. Let us know how it turns out. Blessings. Well I used a different recipe but did use the orange oil I mentioned and it turned out great! Thanks a million! What is the shelf life of the homemade toothpaste? Also, how much does it make? 5.33 oz? Shelf life would be the shortest of the three ingredients, all of which are very long. Recipe yields approximately 5.5 ounces. I wanted to say a great big THANK YOU for this recipe. I did make a few adjustments as follows: 1/3 c baking soda, 1 tsp salt (regular table salt cause that’s all I had on hand at the time), 4 TBSP water, 1/8 tsp peppermint extract (I will add more in my next batch). Trying something new is scary so if it was a fail for me no great expense or effort lost and it’s always easier to add than to take away). This recipe was a huge WIN!!! In fact now that over a week has passed since I ran out of store bought toothpaste (I used to have problems with dry mouth) my teeth actually feel way cleaner and the dry mouth issue is almost completely gone. Looking forward to running out of mouthwash so I can start making my own. Awesome Cookie, thanks for sharing and congrats on your success! What recipe will you try next? Blessings. There are So many things to comment on for this thread….but here are my 2 cents. 1. IF Fluoride works, than WHY do we have so many issues with cavities…..in the 20 yrs I have spent in dentistry this STILL baffles me….currently we are experiencing epidemic proportions of cavities in children, which leads me to further believe that it doesn’t work. 2. Baking soda while great can increase sensitivity and gum recession especially in women who are peri or post menopausal and have had hormonal changes. 3. Xylitol is AMAZING for oral health, but you need to know the source. It is either coming from corn (and processed in china) or it comes from North American Birch and is processed in the states……..I research oral health products and have only found 2 sources that are 100% North American Birch. Great post, I love all of the interaction you get with your audience!! Carrie, you’re absolutely correct. Fluoride is probably one of the biggest scams of the 20th and 21st century. Most people don’t know where fluoride comes from or what it actually is. They just believe the corporate dogma that’s been fed to them for decades, without doing their own research. ( e.g.They believe that Coca Cola’s vitamin water is actually good for you.) People really are that simple. The scam of fluoride also reminds me of the food company that is allowed to label their products “Healthy Choice” when many of their products are in fact loaded with stuff that no sane person would consider healthy. I stopped using fluoride years ago, and I’m amazed at the improved health of my teeth. The toothpaste I use does not contain fluoride and I use calcium powders and other ingredients I mentioned above. You’re also right about baking soda. It’s very abrasive and should be used sparingly on your teeth if at all. Baking soda is an acid. I haven’t had any problems w/baking soda…so what do you use if not baking soda? What are the alternatives…? I just discovered Earthpaste toothpaste from Redmond Clay. I ordered a tube and will NEVER buy commercial toothpaste again. I’m going to use the Redmond Clay and make my own. I’ll be using your recipe as a guideline but substituting the clay for baking soda. Or I may mix baking soda and clay. I use a Sonicare toothbrush and will always do so. Since using the clay toothpaste, my teeth have become whiter, my gums healthier and my whole mouth feels better. This is an excellent post and site. Thank you. Can Kaolin Clay be used instead of the white cosmetic clay, I can’t seem to find it. We didn’t suggest people use Tom’s of Maine, we said that we USED to use it prior to making our own; but thanks for the info. Since water even filtered has fluoride, should one use distilled water for rinsing after brushing? It’s best to avoid fluoridated water whenever possible, but any reduction in exposure is a positive. If anyone has any good ones for a mouthwash that doesn’t taste dreadful let me know. Also the recepie above used either peppermint oil or spearmint. Here’s an article we wrote about homemade natural mouthwash. Awesome Jess, that’s great to hear! I had bleeding gums & sensitive teeth in my youth. My dentist told me to increase my vitamin A intake or just take daily vitamins. Bleeding gums are a sign of Vitamin “A” deficiency. I have not had my gums bleed in 35 years! I have been making my own toothpaste for about 6 months and use coconut oil instead of water to make the paste. I also have receeding gums and have no pain or sensitivity issues since switching over. I use the homemade paste 2x per day and prior to making my own used it 1-2 times per week to help with whitening. The coconut oil seems to be the trick as it makes it feel “slicker” than when made with water. Call me what you like, but I brushed my teeth once a week with water only and did not see a dentist for nine years and had no cavities or even signs of them. Prior to that, I had only four major staining teeth with the same brushing habits and had not seen a dentist for fourteen years (at fourteen years of age). I did not eat meat or dairy or white flour or white sugar, no refined foods, no alcohol. Then I had children, my diet changed, my brushing habits “improved” (a lot more frequent brushing out of necessity! ), and now I have a ceramic filling and several “watched” teeth. I have found that Philips Sonicare toothbrush line gets your teeth very clean with no toothpaste and since using it my gums no longer bleed (the bleeding started with the new, refined foods diet and children). It tastes good to use toothpaste and of course I would not buy one with flouride and it makes sense to make my own, which is why I am here, obviously. I wanted to know what other people are doing and what everyone thinks. I will say though that I don’t think it is necessary for every day situations to polish your teeth with abrasives. Eat well, chew your food thoroughly, rinse with water, brush gently when you need to, and take care of your special situations in the gentlest manner possible, and be blessed. But if it tastes better, make a healthy toothpaste and use a small amount and don’t worry so much. Even the purest of water can kill you, if you ingest too much. We have so much to be thankful for! Thanks for the info, some of it I’ve heard before (avoiding processed foods), other parts not so much (brushing once/week). From what you’ve said I would encourage people to avoid processed foods but also to brush daily – but yeah, using toothpaste has little to do with it. Saw the toothpaste recipe and thought i’d suggest to y’all to put it in large oral syringes. It is less mess and reusable, as well as sanitary. So you personally use this ‘toothpaste’ once a day and then brush with water any other times? I used to, now I’m using a handful of others that Betsy is making for her next book. I’m the Guinea pig; but I did use this toothpaste regularly for years. Matt, Have used your toothpaste for a long time, but have always made it with a fraction of the salt called for because I don’t like a lot of salt. So many seem worried about the baking soda, but 4 tsp is a lot in 2/3 cup baking soda and a lot of abrasive action. Also, I might point out Arm & Hammer has a baking soda toothpaste on the market. Meaning if it’s so bad, why is there a commercial version of what we’ve been using for the last few years???? And sort of off subject, I’ve toyed with the idea of substituting coconut oil for the water to create the paste. Any thoughts? And please people. DO NOT USE FLUORIDE. We’ve been scammed big time when it comes to fluoride. I stopped using fluoride years ago, and the health of my teeth improved! Yes, it improved. Do your research on fluoride and you’ll see what I’m talking about. I need to add some things to this recipe…. a. Aloe vera juice – adds creaminess and healing properties. Fresh aloe vera is preferable here. Many people have aloe vera plants growing in their garden. You can put some of those spikey leaves to good use. Use the meat part of the leaf, not the skin. I see that some use essential oils. I purchased spearmint 100% essential oil and on the label it states, “not for internal use”…what’s the story? All that’s in it is spearmint. Janice – I seem to remember that there are some essential oils used for aromatic purposes so don’t have to meet food grade standards. Ask at the health food store or double check it on line. Essential oils are an extremely concentrated version of the plant they came from. They are very potent. It’s easier to label it “not for internal use” than to try to educate people about how to safely use them. I have used EOs for years, mostly externally, but occasionally use them internally (one drop in a capsule). This is not one of those things for which “more is better” should ever be considered. Also, since this is toothpaste, hopefully you aren’t going to internalize it anyway. After investigating, I found this to be true…thanks for all the info. Thanks for sharing the recipe. I will have to try this. I too oppose the fluoride and don’t want it anywhere near me. Question, I get baby toothpaste at a store which my toddler can swallow, would this recipe be safe to swallow? I don’t think baking soda can do any harm right? I use straight up baking soda, in a small container. Wet my toothbrush and then dip it in (mostly because I am the only one using it and I haven’t gotten a container that easily pours onto the toothbrush). I have used it like this pretty much for a year straight, and off and on for a couple of years prior. I have noticed that my gums bleed far less than they used to at the dentist’s office, which is awesome! I was in for the first time in TWO years and they didn’t find cavities or put a watch on any of my teeth and my gums did not bleed at all!!! So, the scale Matt shared earlier shows that straight baking soda is essentially harmless. But baking soda is highly reactive–that’s why it’s so good with cleaning and baking! So as soon as it’s mixed with water it changes and oxidizes the stains. I’m still going to make this paste, but I think I’ll play it safe and only have my hubby use it twice a week tops. I knew someone who always used salt on his teeth. He was an older man and never used tooothpaste in his life. I don’t think he had a lot of trouble with his teeth, either. TP is a modern invention and flouride is a toxin. I am new to making my own products. I was so excited when we got low on toothpaste. My partner was skeptical but after using it just once, she said, “I don’t ever want to buy toothpaste again!” The only thing I did differently is using cinnamon instead of peppermint because neither of us like peppermint. Technically (maybe too much so), the cost per ounce may be cheaper because of the water added… when I made this, I used about 5 or 6 TBS water, which might reduce the cost per ounce further? You should only use a TP with this much baking soda once a week- it will cause abbrasion of the enamel. Fl at 1450 PPM as most TPs are is safe (unless you swallow the whole tube in 1 sitting) and reduces tooth decay by more than 70% when used on a daily basis. It is extremely important it is used on a daily basis. Sensitive TPs use complex ingredients to block the dentine tubiles, which give the pain. DO NOT USE CLOVE OIL, it makes treatment required very complex as you cannot place most dental materials over the top of it. Companies do make money from TP – but spend years developing it for a reason. reference. I wonder what dental schools teach. I recently made toothpaste using your recipe. I have just read that using baking soda too often will remove the enamel from our teeth. Do you know if this is true and if so what would you recommend? I have been using these basic ingredients plus one extra…Nutribiotic (grapefruit seed extract). I have seen a huge improvement in my oral health and find it to be the perfect remedy for garlic breath. I also make my own mouth wash with Bragg’s ACV. Great post. I still mainly use regular toothpaste, which bothers me with the ingredients. I have tried a herbal toothpaste but didn’t really like that one either. I am really keen to try your toothpaste recipe. I’d also like to try your shampoo. For a couple of months I washed my hair with my homemade soap but I started to get dandruff (which I’ve never had before). Have you found dandruff problems with using the bi-carb recipe. Oh, my hair is long too, if that makes any difference. The baking soda shampoo will not promote dandruff. City water with added chlorine is a big contributor to dandruff. Their homemade shampoo recipe shouldn’t give you dandruff. Your homemade soap does because just like any store bought bar soap, it is too drying for the scalp. Shampoo is made with sulfates, not pure soap so it’s a lot gentler. Baking soda shouldn’t be drying at all. Just to clarify something — dry scalp isn’t dandruff. Unfortunately, that is a common misconception. I didn’t realize this until I started fighting a really bad case of dry scalp about a year and a half ago. Before you start trying to treat your scalp condition, make sure you know which it is (a good web search should help you figure this out). I’ve see many articles which promise that dandruff is removed by rubbing a little mouthwash along with your hair conditioner. I don’t have dandruff but my scalp did feel very fresh and clean. You might want to try this. In my searches to learn more about making homemade cleaners, etc, I found a suggestion that might solve the “double dipping” of others. One such article recommended saving an empty tube of toothpaste and purchasing one of the little tools that is usually used to roll the wide end up, as the tube is emptied. Their method was to cut the wide end of the tube off and use a baggy with a small hole cut in the corner so that the mix could be squeezed into the empty toothpaste tube, then that end is closed with the “toothpaste squeezer” (for the lack of a better term, preventing leaks from that end. I made this toothpaste and mixed 1 1/2 tsp of cornstarch to make a nice paste, then i removed the needle off a turkey injector and drew up the mix, squeezed it into an empty toothpaste tube. Why not go to the baking /candy making isle at the store and get one of those squeeze bottles with the screw on tip(w/ a cap) used to decorate cakes and candies. They kinda look like the red and yellow ketchup/mustard bottles. They are see through and i think would work great. You can go to Wal-Mart and get a little tottle bottle for around $1.00. (Travel size section.) Then you don’t have to mess around with baggies or refilling tubes. If the “paste” is liquid enough, it should go right through a funnel into the bottle. Easy, affordable, and reusable. I still occasionally use baking soda to brush my teeth if I don’t have anything else, but if you’re using it straight up and regularly, it can be really bad for your teeth. The way it works is that when combined with water, free radicals are released that are able to penetrate the enamel, breaking a certain type of chemical bond in the stains that lets the stains break up and lighten in color as they dissipate. Well, it turns out that it can actually wear away your tooth enamel permanently, and in addition to never being able to get it back, it’ll be more prone to sensitivity and cavities. I am also an RDA I’n a dental office & do perio surgery- it I’s an ecellent polisher & cleaner & the salt I’s also an antibacterial , however .. 🙁 used to often can cause receding of gums, but if you always use a soft toothbrush ( always recommend) & do not put to much mucsle into it you can get away with it- it removes stains excellent & i recommend it to my patients to use a few times a month, for polishing . 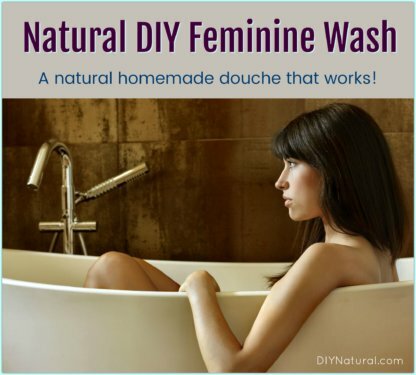 I stumbled upon your site when i ran out of conditioner ( & not a lot of $ to buy it) & googled how to make my own!!! I was so thrilled by your passion to share with us how , now i want to try doing ALL i can on making my own – everything!!! The salt is there for scrubbing but wouldnt it dissolve after a few hours? Salt is used for its antiseptic qualities, not for abrasive qualities. I made this recipe and it is wonderful. I have been using it about 2 weeks and my teeth feel great. I made the recipe with peppermint essential oil. I store the paste in a zip loc baggie in my bathroom, with a small notch cut in the corner to squeeze the paste out like traditional toothpaste tubes. Constance- extracts are for cooking, oils are for adding scent and generally shouldn’t be ingested unless you have the food grade quality oils. For the sensitive tooth paste where would you get the white cosmetic clay? You can order from here Shelley. You can also use finely ground chalk, which is what cosmetic clay is. You should be concerned Rachel. My advice is to only brush once per day with paste. If you want to brush any more than once just use water. I personally believe it does. It is harsh on the enamel and on the gums and in my opinion should not be used more than once a week. I recommend using just baking soda to brush once a week because it keeps your teeth really clean. I think it’s too harsh for everyday use though so I will be looking into something else. Add more or less spearmint to taste you can also add peppermint oil if you want to. To all reading: on the Relative Dentin Abrasively (RDA) scale baking soda is much less abrasive than commercial toothpaste. How long is the shelf-life of the toothpaste if made with baking soda, peppermint extract and water? Not exactly sure but the the ingredients each have very long shelf life, so together the results should be the same. That’s not really a safe assumption. Flour, water, and sugar separately have long shelf lives, but mixed into a slurry they do not and will mold. It’s an assumption backed by our experience. To address the question, our batches last many months and we have never had it go bad. Matt, thank you for the sensitive toothpaste recipe. I was just about to order to http://www.newdirectionsaromatics.com . I will try this out and let you know how it works! Glad to help Terry, let us know how it goes. So it’s mint extracts we want to use not oils? Just seeing what my options are. thanks!! 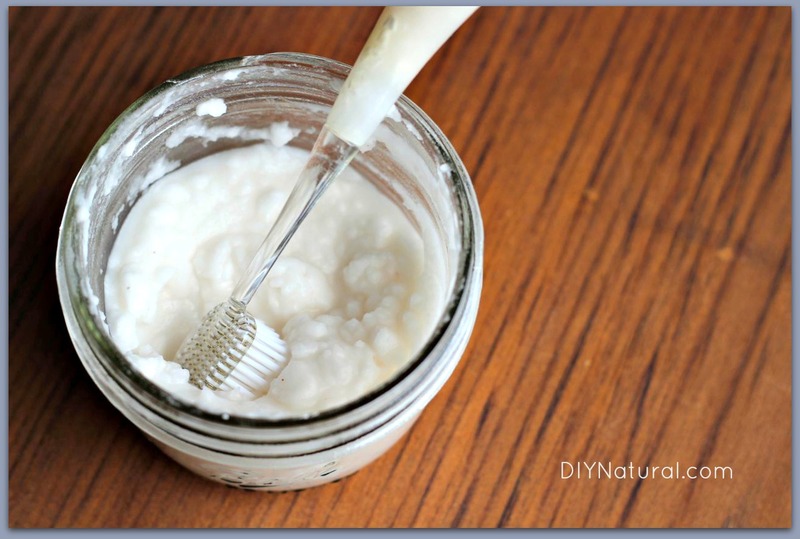 Thank you SO MUCH for sharing this wonderful natural way of making toothpaste. I am a strong believer in natural remedies and in Baking Soda. I appreciate it! Whew! What a lot of great info. I love that you had such a respectful conversation with Ryan DDS. Have used several of the recipes on the site – great stuff. I’d love to use homemade toothpaste (I was thinking coconut oil, xylitol and spearmint oil) but at 56 already have receded gums and without sensitive toothpaste which I believe is just stronger fluoride, the pain is unbearable. Anyone know what I could add? Clove oil? Dr. Ryan? Thank you again Matt and Betsy! PS Melinda, stevia would sweeten but would it have the same health benefits? Hmmm, I would start by brushing softly with a soft bristled toothbrush. Also, be sure you’re flossing daily, and you can try making a tea tree mouthwash. 1.Put all ingredients in a bowl, and whisk them thoroughly until smooth. 2.Fill a plastic toothpaste tube (available at camping equipment stores) with the paste. Fold the end of the tube over several times until its firmly sealed. Or fill a jar with the paste. 3.Store in a cool dry place away from bright light. Use within 6 months. Terry, I (58) had a problem with gum receding around one tooth. I was concerned it would eventually affect all my teeth. I started making Matt’s homemade toothpaste and using it and loved it. However, I saw an article about oil pulling. I thought it was kind of crazy, but with online research figured I had nothing to lose and it wasn’t going to hurt me. I oil pull first and follow up with brushing my teeth with Matt’s toothpaste. I was amazed how the gum around that tooth improved and tightened. My husband said he always had his gums bleed a little when he brushed his teeth and that went away too, once he started pulling. I also notice that I don’t seem to have bad breath anymore and if I haven’t “pulled” for a day, the bad breath returns. I’ve been doing it for over a year now and if I miss a day I don’t miss two, because it really makes my mouth, gums, and teeth feel cleaner. Look into it and see what you think. Interesting Michelle, thanks for sharing. I tried oil pulling with organic sesame oil for awhile but I didn’t keep the habit going long enough to see a difference; sounds like I need to try it again. Thanks, Michelle. I’ve also tried oil pulling out of curiosity. I used coconut oil and did like the feeling but I didn’t realize it might help with receding gums. I’ll try it again. Thanks for the reminder and info. I also have receding gums. A naturopath started me on oil pulling for sinus issues. It was coconut oil with 1 drop of clove oil and 1 drop of tea tree oil. I was surprised when it helped with the sensitivity of my teeth as well. I recently went to the dentist and told her about it and she said the clove oil is actually used as an anaesthetic for teeth. I have since read up about oil pulling but have not found anywhere that adds essential oils as well. I’m excited to try your recipe, but also wanted to remind folks that xylitol, while ok for people, is toxic to dogs. See the ASPCA poison control site for the full story. Since my two labs will try to eat anything that is not nailed down, and some things that ARE nailed down, I make sure xylitol sweetened goodies are kept in a high cabinet. All the peppermint essential oil I have found has said not to digest it. Am I looking for a certain type of peppermint essential oil? Anyone used stevia to sweeten it instead of xylitol? Posted this earlier, and no one responded. I also heard glycerin is bad for teeth, as it prevents “remineralizing of the enamel”…whatever that is. Anyone else heard this? When I mixed mine (and it’s lasted a WHILE), it’s started separating over time. I just scrape my brush in it quickly to mix it a bit and it’s fine…but does using a pump eliminate that problem? Or does it separating mean I have too much of something? I make my own toothpaste and use old empty hand sanitizer bottles as a pump dispenser. I have an instant gag reflex to baking soda and my son nor I like it. However, I found a homemade toothpaste recipe here: http://lusaorganics.typepad.com/clean/2010/02/natural-toothpaste-tutorial.html. No baking soda or salt. It’s coconut oil based and tastes great. She also provides additional information on teeth-care. Has anyone experimented with ratios using coconut oil or xylitol with the baking soda? I backed way down on the salt, but still don’t like the taste. I would be willing to do baking soda with coconut oil or glycerin (I have some) and maybe some xylitol instead of the salt. Would rather have a creamy toothpaste rather than a powder. Anyone have any experience with this or suggestions? I just made a toothpaste with coconut oil. It reminds me of Arm & Hammer toothpaste. You can taste the baking soda, but it’s not that bad. Is it safe for children?? I mean can it be swallowed?? Don’t bother with Tom’s of Maine either. I read the label recently at Trader Joe’s and it contains Sodium Laurel Sulfate which is as bad for you as parabens. I will be trying this toothpaste soon. Thanks for the great article. Thanks for this!!! I figured Tom’s of Maine was just as good, but this homemade one was preferable just for cost. Good to know! This site is full of smart people. Fluoride is debated as contributing to the dumbing down of the population and calcifying the pineal gland. This website explains all uses for Xylitol. Dental, Medical and Nutritional. The link I gave, states that “If used only occasionally or even as often as once a day, xylitol may NOT be effective, regardless of the amount. Use xylitol at least three, and preferably 5 times every day.” Just a little tip =). The site also has different options for when and how to use Xylitol so that it is not limited to toothpaste or gum. I went to school to be a dental assistant, and almost everything in the business is controversial. Some doctors believe one thing and others will completely disagree. Its scary, because people learn to grow and trust one from a certain profession. In reality, in dentistry (and other practice, I am sure), what patients don’t know and are never told, is there are different outlooks on what is ‘right’ or ‘wrong’ for oral care. The fact that dentistry is so unsure about many things is truly scary. I also know a few people who have only used baking soda to brush their teeth for many years and have beautiful, bright, clean smiles! That being said, I would love to try this recipe! Thank you! Can you use stevia in place of the xylitol? I already have that on hand. Here’s another one – this one’s on amazon.com and comes out to 5.67/pound. fluoride is great for strengthening teeth, because fluoride (F) has a very high affinity to the calcium (Ca) in teeth. a CaF bond is formed which is very strong. so if you know that you don’t abuse your teeth it’s better to avoid F in toothpaste, as it can be poisonous in high concentrations. Agreed, it should be avoided – especially in drinking water where fluorosilicic acid is used rather than naturally occurring fluoride. In my local Walmart. It should be with either jelly/jam or dessert isle. I added a TBS of Corn Starch and a tiny tiny bit of lemon curd. It tastes great and I saw an improvement in just a few days. My son(5) likes it more than his Crest soooo take it for what it’s worth. Cool, thanks for the tip Sam. Where did you find the lemon curd? is this recipe safe to use with electric toothbrushes? i’m always concerned that we might somehow over exfoliate or damage our teeth with both the baking soda and the vibration of the sonicare combined. thanks for your help! What if instead of Salt you used Xylotil? Might just maintain the scrubby feeling and make it sweet instead of salty. Just a thought. I mixed baking soda and xylitol and used this to brush my teeth. My face and throat began to feel like it was swelling and my breathing harder. The xylitol I am using is from Kal Xylitol and it is derived from corn, though I have no corn allergies. Could it have been the Xylitol that swelled my face or the baking soda? Though I do use a xylitol floss and before making the toothpaste I was flossing with the xyltol floss and notice alittle swelling in my face after flossing. So now I guess I have to keep brushing with Listerine, I just don’t want my liver to suffer in the future. Does anyone get this as well? Lisa, are you CERTAIN you don’t have a corn allergy? This certainly sounds like an allergic reaction. I do have a corn allergy, and absolutely cannot use xylitol. Even if allergy tests show no allergy, that does not mean you are not allergic. It’s rare to be allergic to baking soda, but it can happen. Seems, though, that the common factor is the xylitol. Teeth feel SO much cleaner using this stuff! It is amazing how great the salt is about scrubbing teeth without scratching them. Thanks!!! Thank you for lending us your knowledge and advise without an appointment. I have been wondering about these things for a while and am putting toothpaste down as my next step towards a self-sufficient lifestyle for me and my family. So, I’m a dentist. I have no problem with homemade toothpaste, largely to avoid detergents and preservatives, or oxide salts that are too abrasive to the gums. That being said, avoiding fluoride — not so fast. An adult in the United States, ya, you’ll probably be fine. When we originally fluoridated water, it was a brilliant move — it reduced cavities in kids by 36% nationally and is largely the reason people have all their teeth as adults now. Losing teeth means a considerably hit to your quality of life and systemic health (poor nutrition). Furthermore, cavities are an infection which can spread to the venous plexus of the head and kill you — yes, you can die from a tooth ache, it happens. Logically, fluoride in the water saved lives. However, it’s plenty now, and since so many drinks, foods, and items are prepared with public water, there is fluoride in everything these days — we call that the “halo effect.” Nevertheless, children still need TOPICAL fluoride on their teeth to promote a specific crystal formulation in the enamel, which is still crystallizing at their age, which is more resistant to acid erosion and cavities. Avoiding fluoride in children all together is reckless and dumb. Little to no research has backed toxicity in topical dental fluorides and toothpaste or water. The only real research that has ever come out was a study about increased osteosarcoma rates in males on fluoridated water, but later studies found no connection. All 56 or so dental schools in the US back fluoride, as does the CDC, which has re-investigated it several times. To put things in perspective, fluoride is ALL NATURAL. It’s the 9th most common element on the earth — you don’t get more natural than that. Fluoride STRENGTHENS bones and teeth, this has been proven time and time again in university research. Wikipedia it for yourself, and check the citations, then check the theories on pubmed. Any dentist against fluoride is trying to profit off the holistic movement, and is ethically unsound, in my opinion. But, I wouldn’t argue that adults these days probably get too much fluoride. Buuuuut, if you still get cavities, then you should stay on fluoridated toothpaste. Now, the paste recipe. I’d be careful with making it too abrasive or you’ll rub off your gums, basically. When you see toothbrush abrasion on teeth and gums, it’s not actually the brush, but the salts found in the pastes, usually serving as whitening agents. I would DEFINITELY add xylitol, which is an amazing anti-cavity agent. I would probably mix spearmint and peppermint extract, as they both have some anti-microbial activity. You could also look in olive leaf extract and oregano for the same reason. I would vary the extracts for the sake of promoting a diversified anti-biotic mechanism. Lastly, the “you don’t actually need toothpaste” comment some dentist make is…………100% true. We all learned this in D school. It’s the mechanism of the brush bristles and floss. IF YOU FLOSS, you don’t really need toothpaste, but I’d still use some fluoridates paste in children. If you’re still skeptical about fluoride, then just do this for me, please: avoid it, but make sure your child has a treatment performed by a dentist, which will minimize consumption, every 6 months or so. Thanks Ryan, I totally disagree but still respect your opinion. God bless. I sent an e-mail to one of the main guys in the dental ecology department at my dental school, and his two cents were to avoid baking soda and salt, as both are far too abrasive in the long run. He also said that w/o fluoride, there’s not much point, and you should just brush with water in that case. You can apparently look up abrasive ratings of all the chemicals and salts used in studies on pubmed, if you’re interested, that would be a great place to kind of get your bearings. I can tell you from clinical experience that people’s overuse of whitening toothpaste is already really reducing gums over the years, and the table salt is enough to abrade enamel. If you’re dead set on avoiding fluoride, which from a medical perspective I simply do not agree with (I have to add that), try plain old glycerin with extract from peppermint, spearmint, and/or thyme. You might still add xylitol, or rinse with it, but again, you should look up it’s abrasive rating if available. It might be best left as a rinse ingredient. I understand, you have a lot of confidence in the healthcare position. I encourage you to research the differences between what you refer to simply as “fluoride”; specifically naturally occurring vs. what is put into the water supply. Further, medication (fluoride or otherwise) should not be added to the water supply, but rather administered on an individual basis like all other medication. I have read about the theories of the F- source being that which is industrial byproduct and thus contains cross contaminants. I have no doubt there’s at least some level of truth to that, as it makes economic sense and the govt/lowest bidder setup. Nevertheless, F is the most electronegative element, and is going to ionize into free form in solution and react readily in a constant equilibrium. I’m not going to delve into the conspiracy theories. In some perspective, I actually agree with you — adding F- to the water is arguably unconstitutional. But when I put on my dentist hat, I see millions of kids who do not receive dental care because their parents do not value it, or choose not to for financial/other reasons. For a large percentage of them, F in the drinking water means teeth in function they wouldn’t otherwise have as adults, less tooth ache in class, better nutrition, etc. People who are more well off have options to avoid the F in water, much like you apparently do. You could also argue that due the halo effect, that’s become increasingly difficult, and you’d be very correct. At the end of the day, it’s a tough situation and I don’t have a right answer for you. I do not doubt for one second that we can and probably should lower the ppm found in tap — the increase in fluorosis in teeth is well documented these days from over exposure. However, I still stand that the F- you find in dental products is not that industrial byproduct. If you want extra security, you can use a source such as Stannous fluoride, which is a F- ion linked to tin (i believe), and is patented by crest (if the concept of it being patented gives you mental security). We use very specific topical fluorides in dental practices as well, and work very hard to minimize ingestion, which is especially true with the varnishes which are largely replacing the old gels of our childhood/teens. That of course have BPA, which is one thing I’m not fond of. At the end of the day, every medication, EVERY ONE, is toxic. You need to weigh the pros and cons. You can use that same argument to argue against it in the water supply. You could add to it by saying times are different and decay isn’t the epidemic it was then, and some people could argue against that. I think of the poor kids and the negligent parents (increasingly important issue in so many things), as sappy as that is. BUT THIS ABOUT HOMEMADE PASTE, which is something I think is really cool. The article actually inspired me to try out some homemade rinses of my own – I’ve got extracts of spearmint, peppermint, thyme, and oregano on the way, as well as a half pound of xylitol. So I guess, my biggest takeaway I’d like to get across is watch out for the abrasive agents. You’re going to put a hurting on yourself with the salt, and it sounds like it with so much baking soda, too. I have no doubt you feel clean after brushing with this stuff, probably super slick like after a hygienist polish — but that’s become you’ve taken off a couple microns of enamel. Also, recession is not fun/pretty once the root surfaces get sensitive, nor is thin enamel. I think you can go without abrasion and use some natural antimicrobial/cleaning agents out there. I gather you believe fluoride intake needs to be supplemented. I believe otherwise. On all levels the intake of fluoride or anything else needs to be an individual decision, not a mass decision of a medical body or municipality. I’ve been using baking soda alone for the past year and my last visit (a week ago) to the dentist revealed no new cavities and a praise that I had very little tarter. This recipe might get my children to make the switch, it is definitely worth the try! You forgot to mention a MAJOR reason for why one would want to make their own toothpaste – avoiding plastic waste from toothpaste tubes!!!! If there are 10 million people in Los Angeles, let’s say that 3 million of those people (1 toothpaste tube/3 people?) have toothpaste tubes in any given month. Let’s say that it takes 2 months to use up their tube. And let’s round down from there. Let’s say that every 2 months 2 million toothpaste plastic tubes end up in a landfill. I think that is enough waste to fill someone’s home!!!!! If everyone started making their own paste, a huge amount of waste would be eliminated. Plus, the health effects on the environment and human health of baking soda, salt and peppermint oil are probably very minimal in comparison to whatever is in store bought paste. Pipe homemade toothepaste into an empty toothpaste tube using a ziplock bag and an icing tip! I’m concerned that several of the commenters have said that baking soda contains aluminum, which is untrue. Baking soda is just sodium bicarbonate. The commenters are confusing baking SODA with baking POWDER, which is a totally different thing. I started wondering about this when one person said that baking soda foams in his mouth, which it should not, but baking powder will, because that is what is used to leaven baked goods. Some baking powder does in fact contain aluminum, but the Rumford brand does not. ooooh, double whammy, I am going to use the recipe for homemade vanilla extract to flavor my homemade toothpaste and make vanilla toothpaste! Great Idea for toothpaste, however 2 important ingredients were left out here. TEA TREE OIL and CALCIUM. Tea tree oil is a natural antiseptic that clings to your teeth long after you are done brushing, helping to repel bacteria, including plaque, and the damages caused by eating sugary foods. Do not use too much of it though, as it’s very pungent. I’ve been able to find tea tree oil easily at Kmart. Trader Joe’s used to have it. I don’t know if they stock it anymore. CALCIUM can be found at any place that sells vitamins. Just crush the vitamin up to turn it into powder form. Then you can mix it in. And please stop using fluoride. You’ve been scammed. it’s not good for your teeth or your body. A note about fluoride!!! Every pediatrician in my area is recommending that parents do NOT use “nursery water” because it contains fluoride & they are saying it is potentially toxic to the child’s system. If they are saying this about water then how would toothpaste be any different considering children swallow more than they spit out? Simply put, it wouldn’t be any different. It’s amazing the information being successfully sold to our culture. I figure the simpler the better. Love this website. I make my own toothpaste and now laundry detergent and dishwasher detergent as well. As I have been researching natural ways to take care of my teeth, I found out a few things – Xylitol is an excellent addition to making a tooth powder as it is antibacterial, stops plaque from forming and significantly reduces tooth decay! I store my mixture in a bottle, shake into the palm of my hand and press a rinsed toothbrush into the mixture and pack it in. I do not scrub my teeth, I use a messaging motion along the gum line with a soft bristle brush. 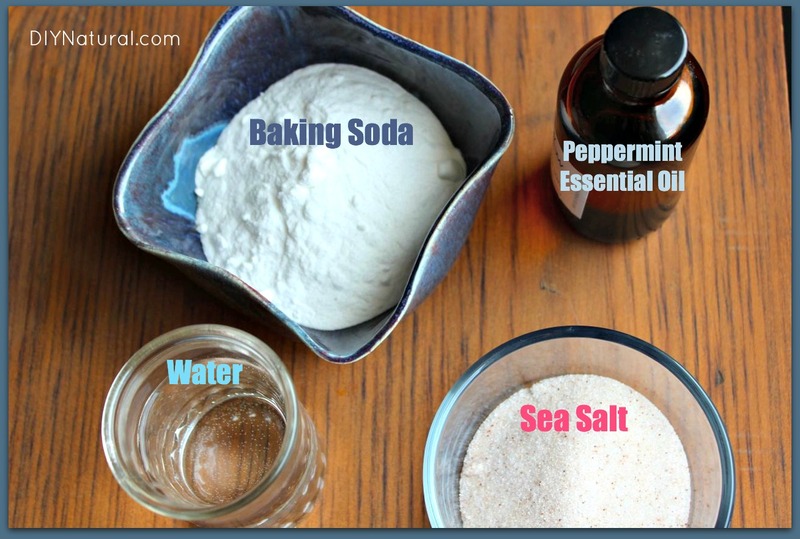 I use 2 parts baking soda, 1 part salt, 1 part xylitol, and peppermint oil. I purchase pink himalayan salt that I use in cooking so I use it for my tooth powder as well. I am not concerned about the cost as this salt is full of minerals, and highly benificial. I am susceptible to gum disease. My last terrible dentist visit led me on my search. Now my gums are healthier than ever, no more bleeding and my teeth are cleaner than any toothpaste could ever get them. Thanks for this wonderful website by the way! Glad you like the website Leila, thanks for stopping by and adding to the conversation. Yeah, Xylitol is awesome stuff. I have made toothpaste similar with added pumice (food grade) powder and I mixed and stored it in an empty bottle sold for putting ketchup or mustard in for serving (a plastic squeeze bottle with a tip and cap) and just wash it well with soap and warm water between batches. Great advice Lori. People should avoid using Hydrogen Peroxide if they plan to store the toothpaste because the acidity of it can eat through plastic storage containers… use water instead. Awesome, thanks for the tip AJ! God bless. Yeah, and it’s awesome! It’s also easy to fill. Yeah, I leave the salt out now too… just too much salt for me. Good idea to add vanilla, let me know how it turns out. We’re working on another toothpaste containing Xylitol. I have stopped using any fluoride toothpaste. I actually switched to a childrens toothpaste Orajel Training Toothpaste. I use this and then I brush with Natural Baking Soda, which I bought in a health food store that has no aluminum in it. Between the two, my gums have stopped bleeding and receding which has been happening all my life. The last time I went to the dentist, which was in 2008, I went in for a cleaning and was only in the chair for about 5 minutes. He told me that I did not have to come back for about 10 yrs. He said that my teeth and gums were so healthy and he was very pleased. I told him what I was doing and he was going to research it. I will look into what you said, that you really don’t need toothpaste at all. I am going to start brushing with just baking soda and water and see what happens. Even tho natural baking soda is much more expensive than regular store bought, a one pound bag has lasted me for almost nine months. Yes it is very salty tasting, but you do get used to it. It took me about a week of regular brushing to get used to the taste. Thank you so much for all that you do. It is so beneficial for all to use natural products that won’t harm us. I believe that may kids dentist said that most city water had fluoride added to it. So even if you don’t add any you may still be getting some if you have city water. Great point Tricia, it’s always best to use water you know is free of fluoride, not just for this toothpaste, but for everything. Betsy and I have city water and are constantly refilling out 2.5 gallon containers with pure water. Instead Of Buying A Tube Of Toothpaste For $5.00,I Just Buy 1 Or 2 Travel Size Tubes.At Wal-mart They Are 97 Cents Depending On Where You Go,I Guess. Have you thought about using an old toothpaste tube? I have been thinking about it for a while now. And it seems to quite possible. Just cutting open the flat end and washing it out and either leaving it open or closing it with a hot iron. I have as read that you could use hydrogen peroxide instead of water , it has the same texture. We are a flouride-free family! As children we got quite ill after flouridation treatments at the dentist and our parents had worse side-effects from the treatments even causing other long-term medical conditions. None were life-threatening, but none-the-less they were damaging to their health and well-being. Myself (having on ly one cavity in my life) and my family fo 5 other members are still all cavity free with stellar dental check-ups and health in general. I definitely support that each person should do their own research (include as many different sources as possible to get the full picture, and try to see both sides clearly), then make an educated decision on what you believe is right for your family. Contrary to popular belief it is not only sugars that deteriorate tooth enamel. For me it was acidic foods, as we eat a lot of citrus fruits, tomatoes, and even sugar-free kool-aid that are all full of citric acid. In every choice we make regardig the precious health of ourselves and those we love it is best to be as informed as possible about the pros and cons. I’m a cake decorator, and in the candy making section of the store where I buy my supplies, there are DOZENS of concentrated flavoring oils that could be used. The possibilities are endless. I’m going to try this after my next trip to buy cake supplies! Awesome tip Jessica, thanks! Be sure to come back and tell us how it goes. Jessica, you bought these at a candy making store? I didn’t read all the comments so I don’t know if others have said this. From the reading I have done about fluoride, the consensus is that fluoride in drinking water is a TERRIBLE idea, leading to many health issues, including weakening teeth and bones. However, the original studies which led to the recommendations for fluoride were actually based on local fluoride on teeth, which showed it strengthened the teeth and reduced cavities. Overall I have heard even holistic dentists say that fluoride in toothpaste or mouthwash is fine and possibly helpful, but is a definite no-no in drinking water or for kids who might swallow the toothpaste. On the other hand, I don’t think it is absolutely necessary to have it in toothpaste since there are a multitude of factors that lead to healthy teeth, including diet, mineral deficiencies, eating habits, flossing etc. However, I was concerned about the possibility that using the baking soda everyday could be too abrasive for teeth. At least on a toothbrush. From what I read, it is good to use baking soda and salt as a rub on your gums, using your finger but as a scrub on your teeth it might be too harsh for daily use. I saw where you mentioned using clay as a replacement for the baking soda and I don’t know if that would make it less abrasive but I would probably try that one myself. In any case, my one holistic dentist said that he doesn’t use toothpaste at all, just a soft toothbrush on its own. The toothpaste is unnecessary since it is just the action of physically removing the built up bacteria that is needed. He also said it is more important to brush before eating rather than after so that you reduce the amount of bacteria that is stuck on your teeth before you add potential food sources for them to your mouth. Thanks for your site though, I have been using homemade natural detergent for about 3 years now, having saved tons of money (since I would have only used natural detergent which is more expensive at the store) already. But the flavored is not that bad and you do get used to it. But now I will be doing this paste and save some money…thanks. Would this be ok for kids? My 23 month old LOVES the flavored children’s toothpaste, but I worry about the amount of floride he ingests since no kids spit out the toothpaste. What would you do to make kinds/infants accept this form instead of the store-bought kind? Would it be ok to ingest? I’m glad you asked Colette… I’m currently in the process of developing an updated recipe that will be more of a paste, have some sweetness (from Xylitol which is a natural sweetener shown to be beneficial to teeth), and be more suitable for children, and yummier for adults too! If you’re not already be sure to subscribe so you don’t miss the updated recipe. I also HATE childrens tooth paste. I am going to try experimenting with baking soda, xantol, and coconut oil.. I think I love you Matt! I’ve always hated buying toothpaste because of the fluoride, and the natural ones are just so expensive! Thank you for this recipe and your other ones. I’m hooked! Just wanted to add that typical baking soda has aluminum in it. If you can find aluminum free, it’s that much better for you. (look up aluminum on the internet to find the hazards) I’m also leery of plastic containers (much of the plastic can release potentially harmful chemicals) and suggest glass for storing whenever possible and practical. Maybe it’s just nostalgia. . . I still long for Pepsi in a 16 oz. bottle! You mentioned Glass bottled Pepsi and made my mouth water 🙁 …. Everything tastes so much better when put in glass. I wish it would it is so bad for you… Petrolium is also USED in food dyes and and additives 🙁 As well as a starter for many white vinegars including Hinz YUCH 🙁 I like to use white vinegar for cleaning and I get a natural one if possible as i would rather avoid buying food products made with petrol products…. If people were more informed. I didn’t KNOW white vinegar can be made with petroleum!!! (Am I understanding that right??) I have just started buying it in larger quantities as I’m using it in my cleaners and laundry soap, but didn’t know there was a more “natural” form of it; I’d just been buying Walmart’s brand. Thanks for enlightening! It would be great if people were more informed, yes…but speaking as a newbie to this, remember – there’s SO MUCH to KNOW!!! Hard to get every piece all at once. 🙂 Grateful to the bloggers who are spreading the word! Actually after I seriously studied it I learned its a myth about the aluminum in baking soda, its an ingredient often added to baking POWDER but not soda. Read the box and it will say Sodium Bicarbonate which is Sodium, Hydrogen, Carbon, and Oxygen but not aluminum. The myth about aluminum found in baking soda first showed up when brands with aluminum-free baking powder started advertising it on the box, then Bob’s Red Mill seeing how well it work advertised it on their baking soda box too thus causing some people to think it meant ALL baking Soda had aluminum in it. (Its kind of like how you’ll often see grain-less products like syrup waving “Gluten-Free!” on their labels when everyone knows it never had it in the first place.) When I learned about this it was a huge relief to me cause Bob’s Red Mill is SO expensive! Now I buy 50lb bags of Arm and Hammer! So be at peace as you purchase your $0.98 1lb box of baking soda. Sadly, some syrup does contain wheat or other ingredients that can include gluten. It is helpful when something is labeled that it is certified gluten free (even the strange items). However, it would be perfectly fine with me if it was just listed with the allergens. I am going to try this. I think I am going to get a small squeeze bottle (like the ones they Ketchup and mustard are put in. Once prepared, does this recipe have an expiration date when to use it by? As my “chemically laden” products run out I am replacing them with homemade recipes. I glad I found this site. No, this should be good for years Melanie. I suggest putting some xylitol in it to sweeten it up. Xylitol is also good for your teeth – it’s a natural sweetner that is good for teeth, it’s in a lot of the new organic toothpastes… and makes the baking soda toothpaste much more palatable. I am really happy to find these easy to make recipes for my daily needs. It’s not only about saving money. Pretty much everything on the market today gets tested on animals, also it’s healthier. And when I think about how much less garbage I produce, I have a clearer conscience and feel more in harmony with my environment. Thank you! The taste is a bit “off” but the price is perfect! Ha ha, yeah… can’t argue with you there, but it works and like you said – the price is right. A trick to try is to make it more palatable is to mix in some coconut oil and xylitol. I was going to suggest coconut oil! Coconut oil has a natural whitener in it. It also gives the toothpaste a better consistency! How do you know what to use and how much? I mean, some things are not safe to mix with others because they make chemical reactions? Do you have any guidelines? I have not made this yet, but have an idea for a container. You can buy squeeze bottles for mustard or candy making that have lids. I think that they would dispense the toothpaste without making a mess or getting ‘germs’ in your container. Also, if you find one with a lid, it will keep anything from getting in. The plastic bag idea is cool, but i think it would be messing in the long run. Just a thought. Just wanted to share my experience with baking soda and sea salt. I used it for about 3 mos. and my teeth started to hurt. I was careful to brush gently and reduced the amount of powder I was using. When I next saw my dentist, my teeth really hurt and were very sensitive to cold. The dentist said I had thinned enamel and put some kind of sealer on my teeth. I hated to switch back to regular toothpaste but the dentist suggested this would be best and I now use a brand for “sensitive teeth.” I’m 58 years old, had great teeth all my life, so it was very disappointing that I very likely actually damaged my teeth using this formula. Sorry to hear about this Carolyn. For the benefit of readers and as a comparison, I have been using this toothpaste for about 18 months and have had no problems. There are many things that can affect the health of our teeth, with our diet being paramount. My dentist also said that baking soda paste like this is too gritty and can damage the enamel of teeth. Go have that “sealer” removed immediately! I had the same thing due to receeding gums, and it has destroyed my teeth where the sealer was. I am 62, and didn’t have issues until the sealer wore off, and I noted dark staining where it contacted with my teeth. THEN I got a dry mouth issue which only made things way worse! Right now, my teeth and gums are sore, irritated and bleeding, which no amount of homemade toothpaste will help, nor HP, although I have tried them all. All because, I feel certain, I had my teeth sealed. I still refuse traditional toothpaste for all the toxic ingredients, but am at a loss about what to do for my tooth health. Just a word of caution about using cinnamon…..(love the post, by the way)….we recently used cinnamon toothpaste and thought my daughter and I had some weird mouth condition. She was in pain and I had a tingly tongue and was salivating too much. Turned out to be the cinnamon. I just wanted to say thanks for all the great recipes! I’m learning so much about making things homemade. I’ve done the laundry soap and it works great, disappointing that there are not more suds, tends to make me feel like it doesn’t have the same cleaning power, but the clothes still come out clean! I have six people in my family that I cook and clean for so it’s very helpful to me financially. Thank you, thank you! God Bless you! Glad you discovered this site and that it is a blessing to you. Thanks for the recipe! Another idea for storing the paste is to get a small travel size container (like from Walmart in the travel size bins). It’ll squeeze out like you’re used to toothpaste doing and you won’t have to replace it. Just clean it out between refills. Haven’t explored the site a whole lot but like what I see. I wet my toothbrush with HP and then dip my brush in baking soda. I grew up with using baking soda but got away from it. Living in Santa Fe, NM I developed terrible allergies and a real sensitivity to chemicals which got me totally away from fragrances which are mostly combos of chemicals and not real “perfume”. When you think about how many different chemical perfumes you use in a day—shampoo, conditioner, soap, lotion, deodorant, moisturizer, shaving cream, hair gel, hairspray, after shave, makeup, lip balm, dish soap, laundry soap, dryer sheets, and then perfume or cologne!!!! It’s no wonder we are sick when you add all the different chemical laden cleaners under the sink as well as pesticides, herbicides and artificial fertilizers people use on their lawns and in their gardens. And that’s not even counting all the different ones every store and restaurant and business is using that you are exposed to in one day. Get rid of what you can at home. It’s worth it. And tell businesses when they are overdoing it in the chemical department. I had to complain to my bank because so many women working there were smothered in so much perfume I got an instant headache when I walked in there. Hi Patrica, I completely agree. To my surprise and excitement, I do not use any of the products you listed above but rather go without, make my own, or use organic/locally homemade. Howdy. I am getting dentures for top. The denture lady told me not to use toothpaste on them. She said to brush them w/ a few drops of dawn dishwashing soap. Samantha, Do a search on the uses and cautions for using hydrogen peroxide. It does kill germs and can be used as a mouthwash but with caution. You should never swallow it, and over use or using too strong a solution can cause a wound to heal more slowly – it kills the new skin cells along with the germs. I would recommend diluting it and not using it everyday. I have read that most doctors no longer recommend it for cleaning most wounds due to the cell damage. using Hydrogen Peroxide for mouthwash? This is the same HP that you use with scraps right? How much do you use as a mouthwash and do you dilute with any water or just straight HP? Interesting idea; may have to look into a bit but i do like the all-natural feeling about it. I dilute it with water about 50/50. Yeah, it’s actually better to put an essential oil with antibacterial properties on wounds. Oh, and we have well water – no flouride. My children grew up using “regular” toothpaste but not drinking water with flouride in it. They are 18 and 23 and have no more cavities than average. The debate about the safety of consuming flouridated water has been around at least since my first child was born. I was always glad we had our own well with no flouride or chlorine. I put some baking soda in a shot glass and keep it in the bathroom drawer. I just wet my toothbrush and dip it in the soda. My dentist told me to use a paste of baking soda and peroxide to get my teeth extra clean. So you could combine the two and save a step. Yeah, actually I started doing this after writing this post… I should update it. Now I mix the baking soda with HP rather than water. When I don’t have my tootbrush on the charger, (it lasts all week on a charge), I keep my brush inside a toothbrush holder emersed in HP mixed w/water…next time I’ll just use HP. Or can we use distilled water? I have been searching for a toothpaste that doesn’t contain sodium lauryl sulfate for my teenage daughter that gets chronic canker sores. There are many possible contributing factors one of which is sls. I thought Tom’s natural toothpaste would work but I was surprised to find out that it contains SLS. Burt’s Bees has been the only toothpaste I could find that doesn’t contain SLS and a small tube costs over $4. Unfortunately my daughter doesn’t like the taste of the toothpaste so I was extremely happy to come across this website. I will be making up a concoction of my own based on the information posted and see what happens. Thanks to all who have contributed. I just made your homemade toothpaste this morning. I didnt use the fine sea salt, didnt have any on hand just regular sea salt. I added lemon extract to it. The taste was not bad. To me it tasted salty that’s all. My 2 1/2 year old daughter didnt like it at all. She kept spitting it out. But I got her teeth brushed. Now to find out how the 19, 7 and 5 year old will like it. Hmmmm. I am using it because I have Fibromyalgia and have read about Flouride poisoning being a contribute to Fibromyalgia symptoms. I thought I read somewhere on here to use distilled water to the mix. When you add water to the concoction, are you using tap water (it has flouride in it)? Also, wetting your toothbrush–more flouride. Just curious–this anti-flouride thing is new to me–are there actual studies showing the harmful effects of flouride? My husband has recently tried “oil pulling” for whitening teeth and as a detox. It seems to get rave reviews but I am waiting to see how he does with it. FYI along with fluoride not being good for you most tooth paste isn’t either as it leaves a coating on your teeth. It takes nearly 30 rinses to get this coating off your teeth. You saliva naturally has the ingredients necessary to reenamel your teeth and prevent cavities but it can’t do that when it’s coated with a chemical. Do some research and you can find that info too. Check out the Weston Price Foundation, he was a dentist. Thanksfor the recipe, Matt. Will definitely be trying it asap. People often don’t stop to think of the dangers of flouride, as well as other chemicals in toothpaste, shampoos, shower gels etc. it is generally assumed that, because the item has made it to the shelf for sale, that it is safe for use/consumption. Another extremely toxic ingredient in toothpastes, shampoos, shower gels etc, is sodium laureth sulfate/sodium lauryl sulfate, not to mention parabens and perfumes. If anyone needs confirmation of this, they are welcome to go to http://www.naturalnews.com and see what Dr Mike Adams aka the Heath Ranger has discovered regaridng these products. I for one, am phasing out as many chemical items from my life as possible, and am already noticing a difference. Another way to get rid of bad breath is to simply chew fresh parsley! One more thing I just thought about. When I buy baking soda for cooking purposes, I buy the aluminum-free baking soda. When I bought the baking soda to make the toothpaste, I just bought the Arm & Hammer brand and wasn’t sure if it was aluminum-free. Does anyone know? If it’s not, it might be better to buy aluminum-free baking soda. Thanks! Perhaps you’re thinking of baking powder? Be sure that your baking powder is aluminum free. Baking SODA contains NO aluminum. Baking POWDER does, and you need to be sure it is aluminum FREE Baking POWDER. Made the toothpaste last night and all went well. I went to Walmart this morning and bought an 8 pack of Glad Ware “Mini Round” tight sealing containers. There a perfect 1/2 cup size and each family member can have their own container without having to worry about germs or double-dipping! First of all, before our family decided to go the toxic-free route, our daughter was brought up on Colgate (WITH flouride). She had so many cavities in her baby teeth she had to get caps put on most of them. My spouse was also raised on traditional chemical filled toothpastes (WITH flouride) and had to have 25 – yes, you are reading this correct – 25 cavities filled about 5 years ago. All while using toothpaste with flouride. Now that we have adopted the toxic-free (including flouride-free) lifestyle, guess what? No more cavities!!! No one in my family, including my daughter and spouse has had cavities in over 5 years. Go figure. Dental health is more than just the toothpaste you use. There is evidence that heredity plays a big part in getting cavities. A good, healthy, low-sugar diet (includeing cokes, soft drinks, etc), along with regular flossing and dental visits will help keep cavities at bay. I’m getting ready to make the toothpaste, but have to back Matt up here on with the flouride issue. People, PLEASE do your research on flouride!! It is a toxin and is dangerous to your teeth and health. Not only should you worry about it being in your store-bought toothpaste, but added to your drinking water as well. First, fluoride is one of the most toxic substances on earth, on par with arsenic and lead. It has no proven biological use inside the human body (teeth included). There is no minimum daily requirement for fluoride. And second, it is a cumulative poison. Only about half of what we consume is excreted. The other half collects in the teeth and bones, making them dense, but brittle. Those little white spots visible on the teeth of many children are called dental fluorosis, a condition which not only predisposes them to decay, but also provides a sign that systemic fluoride poisoning is taking place. Dental fluorosis appears to serve as a red flag for future bone fractures as well. I could go on and on and on. Just google “dangers of flouride”. I don’t want to distract from Matt’s great posting for the homemade recipe, but wanted to give additional information to those who are concerned about it not containing flouride. Thanks for the great site!!! Why oh why do people think just because people have always used something, (like floride) and aren’t dead, that it is ok. Have you not all noticed the increase of many many health problems over the years (like autoimmune diseases, cancer, autisim, ect.) I am not saying floride causes all those things, but floride, along with a whole bunch of other things we are fed because they are “good and safe” when really they aren’t…. Floride worked great on teeth, back in the early 1900’s when people where malnurished. That is the basis on which all the “floride is good for your teeth” stuff comes from. Dentists still believe it because that is what they are told in school. I totally agree with you about the fluoride. My mom suffers from Lupus and Fibromyalgia. Her doctor actually told her that the Lupus was caused from all of the commercial products she purchases as well as artificial sweeteners (she was a diet soda fanatic). I love brushing my teeth with baking soda, I also wash my hair with it from time to time. I wonder, how did people make it for hundred’s of years without all of the processed and synthetic ingredients we use today? With added technology and added “knowledge” comes laziness….people purchase commercial products because they are convenient, never mind the after effects down the road. I am 41 years old and my tooth enamel is wearing thin in my “old age”. This causes pain at the base of my teeth as well as pain when I eat sweet or cold foods. Because of this, I would never use baking soda to brush my teeth. Also, I would not reccomment its use to others because it is very abrasive and could wear down healthy enamel. BTW, extra floride from toothpastes such as sensodyne actually seem to strengthen my enamel because the pain lessens when I use it. While baking soda is an ingredient in a lot of commercial toothpastes, I was told by my dentist it’s too abrasive to use daily all by itself. I also really worry about the baking soda and salt for people with high blood pressure, kidney problems, etc. as you WILL swallow some. Might be good to check with an MD and/or dentist before using if you have health problems &/or small children. I get the do-it-yourself appeal, but I’ll just either buy one of the brands that’s regular-priced for about $1, or favorite brand on sale with a coupon. I love you’re using products already in the house, containers already in the house…it’s great in so many ways-even though a few years ago I was all about “all natural” products like “Tom’s” myself, I love going that extra step now. My kids think it’s great that we make our own “products” , often naming them! Like Superty Duperty Sudsy Soap, or something fun and brag about it all the time. I love that when we go to the store they will think about what we can re-purpose the container for when we buy something- like “if we buy this item, we can use the jug for home-made chocolate milk sauce”, etc. It’s great the internet makes it so easy for us to share these kinds of ideas and how easy it can be to be green without trying, and amazing ourselves with how much we save in dollars today and future environmental dollars-like transportation/road cost and landfill expenses. Thanks for the post and the all the sharing. Hey Sandy, you’re welcome – thanks for stopping by and commenting! What you said in your comment totally embodies the spirit of making homemade products! So many people just plain do not understand it… because they have never chose to focus on all the other benefits. Rather than see the joy and harmony it creates in the home they seem to only focus on how it will “only save a few dollars.” Even if it was only saving money… isn’t that enough? But it delivers so much more. 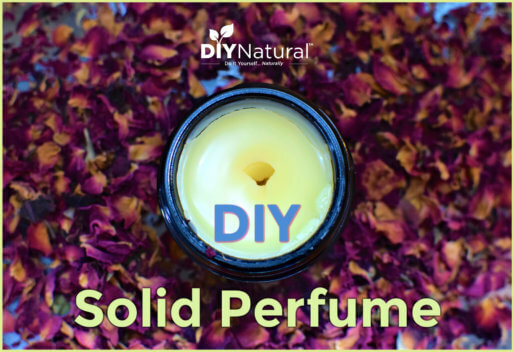 .-= Amy´s last blog ..Another Homemade Deodorant Recipe =-. .-= Rebecca´s last blog ..By: Lisa =-. 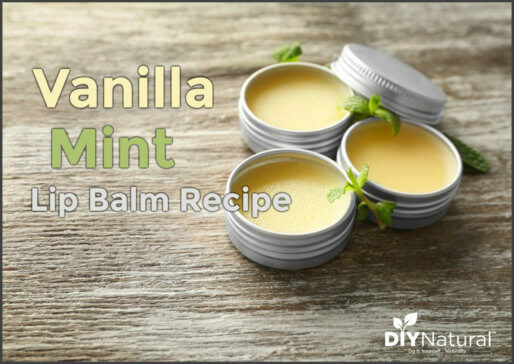 this recipe is so much better with REAL peppermint essential oil. You can use less oil than extract. Also, if you add in some calcium carbonate, you can add in the ‘whitening’ ingredient. All natural! I just made this. I am not sure about the consistency. So far it seems a little too loose. I probably put in too much water. Teeth have that squeaky clean feeling though. I am excited to see how this works out. I have tried the dishwasher and clothes detergents with great results so far. Thanks Matt. You need to tackle shaving solutions next. Thanks! Yeah, if you put less water in you should be good – pour in w/a cup instead of using the facet to lessen the likelihood of mistakes. For shaving I use a bar of homemade soap (we don’t make our own… yet) but my wife still uses shaving cream. A lot of people who make homemade shaving cream go WAY overboard w/the project… taking way too much time & using way too many uncommon ingredients. I always prefer quick and simple! Some simple alternatives for shaving cream include: soap, shampoo, conditioner, lotion, and baby oil. Our family has been using straight baking soda for 2 years. There are 6 of us, so i found adorable little glass jars and filled them each up with baking soda. Each one has a different colored lid that matches each persons toothbrush. No double dipping in our house 🙂 We also use plain hydrogen peroxide as a mouthwash (I haven’t had a sinus infection since we started doing this and i used to have 2-3 a year). Our teeth are white and sparkly, baking soda is abrasive so whitens your teeth naturally. Our dentist is pleased with our teeth, and is respecting our wishes to be flouride free. How refreshing to get an email from someone who has been doing this for years and has seen positive results! I too use Hydrogen Peroxide for mouthwash… and it whitens along with the baking soda toothpaste. This system works so well and costs a fraction of what store bought toothpaste, mouthwash, and whitening systems cost! Thank you so much for putting the part about sinus infections in there. I too get about 4-5 sinus infections a year (I live in KS, enough said!). I will start using hydrogen peroxide as a mouthwash for my teeth AND my sinuses!!!! @ Teresa, have your husband try rinsing with peroxide for avoiding canker sores. Hi, fellow creative folks. Canker sores come from a pH imbalance in the digestive track. Eating GREEN veggies is the best help I’ve found. So, eat broccoli, green beans, romaine lettuce, etc. daily. Also, protects your colon. Green veggies are pretty much a superfood… good for all kinds of stuff! Readers should be made aware now (before a debate ensues) that fluoride as a dental necessity is highly controversial and debatable. While BD holds the opinion that it is helpful, and I hold the opinion that it is harmful (based on our individual research/experience) you are encouraged to do your own research. Just be aware when doing your research that the ADA supports fluoridation, but some of the strongest opponents are dentists who disagree with the findings and hold that there is corruption involved in the policy stance by the ADA. Also… nothing works for everybody. If one person needs extra fluoride for healthy teeth, that doesn’t mean everyone does. Actually, it’s not the fluoride in toothpaste that bothers me; it goes directly onto your teeth and is spat out. It’s the fluoride in water, most of which misses your teeth as you swallow it, and is, well, swallowed, that I wish I didn’t have to deal with. I never had a cavity till I moved to the states where fluoride was in both the water and the toothpaste, as a young adult. Also, didn’t brush my teeth as a child, but did eat lots of fresh veggies. I never had one cavity until I moved to a place with flouride in the water as well for some reason. I don’t know if that had anything to do with it, but it was the same exact time. I know we do not need flouride for healthy teeth. There a vitamins that are healthy that work just fine. If you eat right or just take vitamins there is no need to take poison to avoid cavities. Ivory soap on your toothbrush works fantastically well. Interesting, but does your container keep your homemade toothpaste fresh over the life of its use? That’s one advantage of traditional toothpaste. Plus, I find a tube of toothpaste lasts so long, its hard for me to justify the savings here (what is it, $3 a year?). Freshness? Guaranteed for the life of the baking soda. Question – what are the ingredients in your traditional toothpaste and where do they come from? Seems penny wise and pound foolish. Toothpaste is very inexpensive and with coupons, almost free. Without fluoride this should not be recommended for kids. Let’s save money, but in a smart way. .-= Big Spender´s last blog ..Your Email Hints at Your Credit Score =-. Ahhh, but you are only considering the financial aspect my friend. I encourage you to look outside the box – there is so much more to this than saving a few pennies. If you’re truly worried about kids then I encourage you to study fluoride (it is a toxic poison) and check out all the other toxic ingredients in most over the counter toothpaste brands. I remember the debate in the little town that I grew up in – whether to put fluoride in the town’s water, or not. Fluoride won out because we were told that it was good for us. Fluoride has been linked to all kinds of health problems including hypothyroidism that I will have the rest of my life. So, Big Spender, now I spend money on prescription meds every month. That Tom’s stuff is NASTY! And so what if flouride is a toxic poison? People have been using it for years, that is the way it has always been done. That has to account for something. Maybe that is where we get the saying, “what doesn’t kill you only makes you stronger.” ? You should write a post on Seminary Matt. Come out with $40,000 of school debt to take a job that pays 30k a year with little to no benefits. Hey Joe: For more on fluoride visit the Fluoride Action Network. You’ll be amazed what you find when you start digging. The fluoride used in toothpaste is NOT naturally occurring fluoride, but rather a waste product from, I believe, aluminum manufacturing. Something the aluminum companies would have to PAY for via toxic removal, and is now coming from CHINA. They (the big companies) buddied up with Political pals from government to declare it safe to ingest and put in our tooth products. You really need to research this from MANY sources. I may have some details incorrect, but the ‘theory’ is intact. Doesn’t the baking soda hurt your gums in the long run? Actually baking soda (and hydrogen peroxide) are good for your gums. Hmm, my mom used to make us kids brush with straight baking soda if we ever ran out of toothpaste when we were little. My Momma used to the same when my brother and I were little. At first I didn’t like it, but she was a stickler on taking care of our teeth. They didn’t have dental insurance available back then. I’m 60 now and still use it occasionally. Loved when toothpaste came out with baking soda in it. But, this recipe cost so much less. Beings back fond memories. I use straight baking soda. The taste takes some getting used to, but I get compliments on my white teeth. Anyway, I always see others put salt in it and no one could tell me why, so thanks for telling me why! .-= Emily ´s last blog ..Whole Wheat Pasta – $0.24 =-. Yeah, I’m sure I could do straight baking soda too if I wanted to save more money… although I doubt my wife would. I found if I added too much water, the water separated from the mixture making it look gross. For my last batch I only used a tiny bit of water so its dry enough that you can shake the mixture. I prefer this consistency and dab my wet toothbrush in it. I tried using cinnamon extract. I didn’t like the taste. I was expecting a cinnamon gum taste, but it didn’t taste like that. Peppermint is my favorite. Use cinnamon oil instead of extract. It will taste a lot better! I love these kinds of ideas, thanks so much for posting. I’m going to have to give this a try. I’m always trying to save money, and I love things that are natural and not processed or mass produced. I am not so much on rinsing with baking soda. Kind of foams in your mouth. .-= Money Funk´s last blog ..7 Traits of Women Entrepreneurs =-. That’s part of the beauty of it… you can create whatever you like! Cool eh? I really like the idea – not because of the saving (the 12 or 16 bucks a year doesn’t do it for me) but because of the natural aspect of it. .-= Evan´s last blog ..I Won a $1,000 – What am I going to Do With It? =-. Yeah, there are many positive aspects to this and all homemade products… that is why I make them! I love doing it. Ok, you got me by throwing in the peppermint extract. 🙂 I’m going to have to try this! For the record, I tried homemade baking soda toothpaste before but baking soda tastes like…well, that’s not really a polite thing to say, so it tastes nasty. Took a long time for me to get the taste out of my mouth (fortunately had listerine on hand). I think peppermint extract would probably be enough to cover that taste. Cool. .-= Mrs. Micah´s last blog ..Are Crazy Personal Finance Goals and Challenges Better Than Slow and Steady? =-. Cool beans! It would cut into your cost a bit, but you would still save significantly. Sounds great but I don’t like the idea of “double dipping” the toothbrush. Simply put you mixture in a ziploc or sandwich bag and squeeze to the bottom corner. Cut a very small hole in the bottom of the bag and squeeze out. .-= Lakita´s last blog ..Carnival of Praise Dance #3: Personal Finance Edition =-. Beautifully ingenious Lakita… I may just have to add that nugget of wisdom to the post! You could also use an empty plastic bottle from honey… the kind with the longer tip and a cap. I like that even better Michelle, great idea. Love this recipe! I am also not a fan of the double dipping either, so I used the plastic bags for icing cakes…they have a natural point and are easy to keep clean! Shouldn’t you use something with a cap though? How do you keep it from drying around the hole and blocking it? Not to mention it must be tricky to travel with if you don’t have a cap! Just be creative. We are currently using an old lemon juice container for our toothpaste. You can find silicon containers like you have to have in baggage for airports on Amazon. You can put toothpaste in them and they are great for this as I have done it. They come in 3-6 oz sizes and usually have 4-5 in each set in different pastel colors for use by different family members… I love them! They are easily filled and refilled, too. Was initially worried about something more liquid spilling out, but the top is unique, and that doesn’t happen at all. I’m pretty scared of making anything that goes into my mouth though… especially since my cooking skills are horrific! .-= Financial Samurai´s last blog ..Get An Umbrella Insurance Policy – Your Teenager Is Going To Bankrupt You =-. Sounds good Matt! Maybe I will add some minting Act mouth wash, b/c all I can think about with hydrogen peroxide is the stinging sensation when I had to dab a swab of it on my knees when I bailed skateboarding! Ha ha! Mixing it w/a little Act is not a bad idea, although the taste isn’t bad and there is zero stinging. The taste, by itself, is actually quite neutral. Don’t swallow the peroxide, though! be very careful! I have swished peroxide since I was young….over 40 years, and always am complemented about my white teeth. But as well, I use coconut oil. Put a couple teaspoons in your mouth swish back and forth for a couple of minutes. It is a natural purifier, and will instantly begin whitening teeth, even between! Sounds gross but is actually great!! !